Toss everything into a slightly oiled sheet pan. drizzle with oil and season with salt and pepper. Toss everything together to coat and Roast at 350º for at least 1 hour tossing everything now and then. Hugh suggests a temperature of 375º, but that was too high in my oven…it may take a bit longer. You want a little char, but not burned veggies. Tomatoes: Dry-roasted Ratatouille variation…This is a lovely variation using oven-roasted cherry tomatoes instead of the tomato sauce. It’s great served on bruschetta, or with couscous or rice. Arrange 1 pound of halved cherry tomatoes snugly in a single layer in a roasting pan (slightly smaller than the one you’re roasting the vegetables in). Trickle with a little olive oil and season with salt and pepper. Roast the tomatoes at the same time as the veg, on a lower oven shelf, for at least an hour (but not as long as the veg), until reduced, wrinkled, and lightly charred. 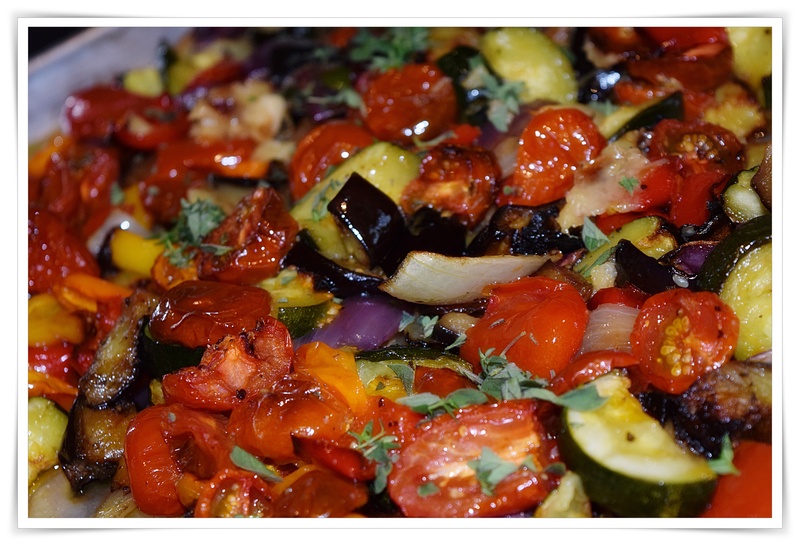 Once the roasted vegetables and tomatoes have cooled a little, toss them very gently together in a bowl. Trickle with a little best-quality olive oil and serve at room temperature.